The Shining Force III Premium Disc was a bonus disc that was available to anyone who bought all three scenarios and sent off the tokens (or spine cards) inside them to Camelot. The Premium Disc is the hardest Shining Force III game disc to obtain as, if you don't have all the scenarios (or bought a used copy with the tokens missing), it is unatainable. The Premium Disc though, usually crops up on eBay occaisionally but is often very expensive. For those that can get their hands on a Premium Disc, the 'game' itself is great fun and an excellent bonus disc (especially if you managed to get one for free). The Premium Disc doesn't continue the story, but offers the player various options including art galleries, sound tests and the all-important special battles. A summary of all the sections of the Premium Disc can be found below. The 3D gallery allows you to view each polygon model of the characters (and enemies) as they appear in the game's full 3D combat scenes. There is a vast range of characters you can choose from, and almost every enemy is included to boot. You can even view each of the playable characters in their different promotions and choose which weapon they hold. The models can be rotated, zoomed in on and you can order them to perform special moves (voice acting included), blocks and even normal attacks. Some of the detail on the 3D models is quite staggering (just zoom in on Donhort's face and look at all those wrinkles!) but equally, some of them aren't amazing - the scenario 1 characters lack the same level of detail that the scenario 2 and 3 characters have. The 3D gallery is a fun distraction and one of the most interesting sections on the Premium Disc. Click here for a translated version of the name list. In the art gallery, you can view character designs for all the characters, including many enemies and NPCs. The images are high quality (and are especially great if you have a good TV) and even feature illustrations that aren't even in the artbook (such as the sketches for the scenario 3 face portraits). Although it isn't as good as looking at the beautiful art in the artbook, the Premium Disc's art gallery is a great addition to the bonus disc and the artwork is really good, especially the three portraits of the heroes. The special battles are the highlight of the Premium Disc. In this section, using a save file from any of the scenarios you can assemble a team using all the characters you've collected so far in that game - so if you use a complete scenario 1 save file you can only use the characters you got in scenario 1, but if you use a scenario 3 savefile you'll be able to choose from all the characters you collected over the three scenarios. Once you've selected your team, you enter a series of battle arenas similar to the hero's test at the end of each scenario. In these 9 battles you can fight bosses not only from Shining Force III but from previous Shining Force games, such as Iom, Dark Dragon and the infamous Dark Sol himself. This option lets you create a customised save file to play scenario 3 with. You are first posed with a series of questions relating to the synchronicity system - this allows you to choose what happened in each of the events throughout the game (so you can choose whether to have Jade instead of Garosh, or Produn instead of Edmund). After you've answered all the questions, you then get the option to rename every playable character in the game! You're not just restricted to Japanese though, you can rename them in English too. Unfortunately you can only input 6 characters for each name, so many of the original characters' names can't be used. However, this doesn't stop you from using you own names and you can have quite a bit of fun thinking of humourous new names to give the characters. 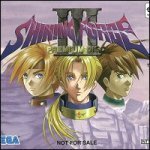 Here you can view several movies relating to Shining Force III. Not only does this section contain the openings for each scenario and the 2 ending movies but there are also commercials for the games and even a lenghty production video! The movies are good quality and the production video is especially interesting to watch (even if you don't understand Japanese) as it contains movies from the game during production including early designs of towns as well as some locations that didn't make it into the final game. In the sound test, you can listen to all the music from the three scenarios of Shining Force III as well as the character voices and sound effects. The sound quality is just the same as it was in the game and as the released soundtrack only contained re-arranged versions of certain pieces of music, and no original music from the game, the Premium Disc's soundtest is very handy. For a fully translated list of the track names on the soundtest, check out the music section. Jumesyn.net's complete walkthrough to the Premium Disc. Translations of various elements of the Premium Disc.